The backup function creates a data file contained a full backup of the database. This feature allows you to create a backup manually at any time. 1. Select Tools→Data Backup to open the Backup database dialog box. 2. Click the browse button to select a location for the file, and enter the name of the file to save. 3. Click the “Backup” button to perform the backup. 4. Dismiss the confirmation box. 1. The backup file is a compressed snapshot of the database. It cannot be opened directly. 2. Be sure to store the backup file on an external or remote drive so it will be available in case your hard drive crashes and becomes inaccessible. If possible, copy the file to a network server that is backed up. The Restore function restores the data from backup file over an existing database. The operation will completely overwrite the current database with the contents of the backup file. To ensure a successful restore operation, it is important that no one else is using the database and no one attempts to log into the database during the restore operation. Uninstall the program and reinstall the formal setup.exe. Before you uninstall the trial Library Management System (ML7E), make sure you make a copy of data backup, you may use Tools>>Data Backup to make a copy. 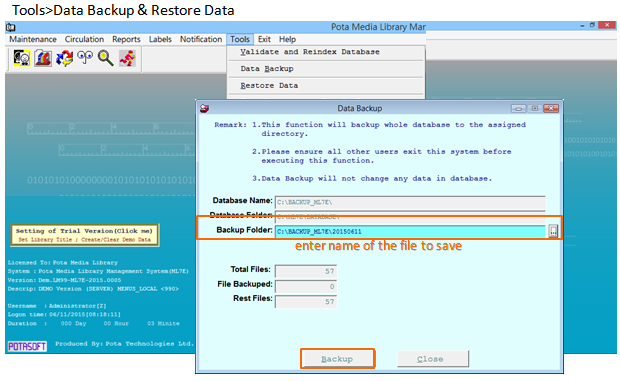 After reinstall the formal version, please use Tools>>Data Restore to restore your database. or you may copy the whole directory C:\ML7E\database. uninstall the trial version, then install the formal version that we provided. Then, copy the backup ML7E\database and replace the C:\ML7E\database. Check if the data is correct. The check for updates menu initiates a connection to our update server to compare the version of the software you are using with the current version of the software. A pop-up message will notify you to let you know whether you are using the current version of the software. If you are using the older version, you will be provided with an option to download the update. 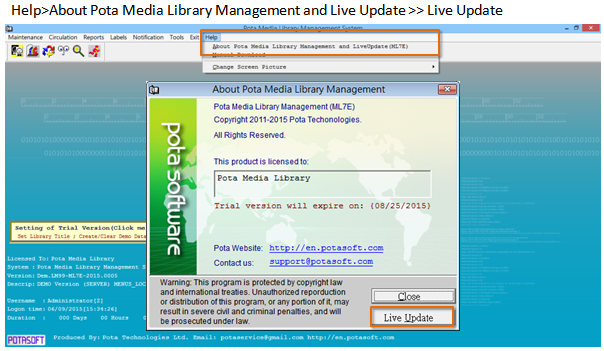 To install the update, download the setup file when prompted, and click Open or Run to update your software. Your database will remain intact, so you will not lose the data that has been previously entered.